Robyn Claydon still leads Bible study at St Andrew's Cathedral in Sydney after 26 years. Revered Bible teacher Robyn Claydon had just come back from Russia – witnessing the opening of the Christian churches after 40 years – when she had a brilliant idea about how to reach people for Christ in Sydney’s penthouses. By providence, Robyn had landed in Russia 10 days after the 1991 coup when people were first tasting the exhilarating joy of freedom to worship. She had been amazed to see how many of the 900 people at one of four Sunday services at Moscow First Baptist Church were standing to hear her greeting. And how there were 400 children in Sunday school when, just 10 days earlier, there had been none. Back in Australia in 1992, Robyn was joint leader of the 8.30am service at St Andrew’s Anglican Cathedral in Sydney. She had been asked to reach out to the people living in the high-rise apartment blocks around the cathedral in the centre of Sydney. 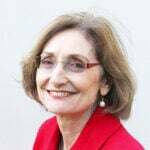 The Bible teacher, preacher and evangelist is telling me how she gave up her salary as deputy principal of Abbotsleigh School in Wahroonga, to spearhead a faith ministry as senior associate for women in world evangelisation with the Lausanne Movement – which is how she came to be in Russia. She is telling me the story in Eternity café at Town Hall after having led Bible study at the cathedral, located just upstairs from where we are sitting. And that Bible study she has been leading for 26 years is still attended by two of the women she met through her pioneering high-rise outreach. Robyn needed a lot of ingenuity to meet people living in the high rises around the cathedral because you couldn’t get past security to door-knock at apartments. She figured that people who moved to the city might try out the cathedral once, so she went through the little cards that visitors fill in to find some names, addresses and phone numbers. After ringing up various people to varied responses, she struck gold when she contacted an elderly lady who lived in the iconic Park Regis apartments just opposite the cathedral. The Park Regis was the first residential tower in the Sydney CBD and its sought-after apartments have amazing views over Hyde Park to Sydney Harbour and the Heads. 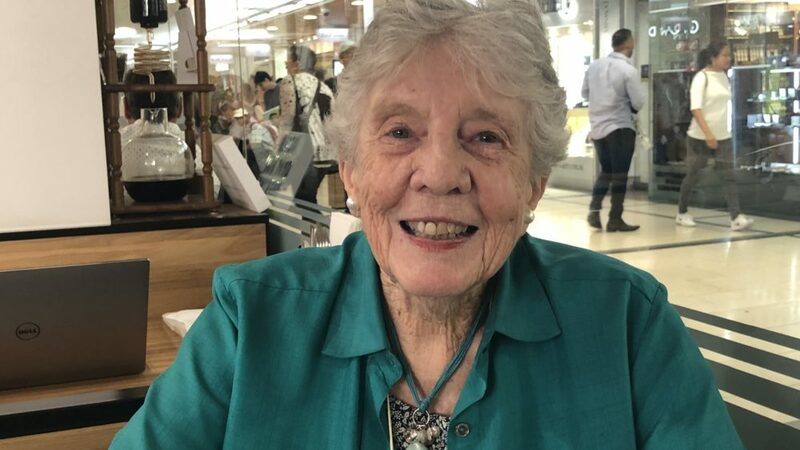 “Her name was Elaine – I had her phone number, so I rang her up and I just explained that I was visiting people in the city from the cathedral and I’d love to pop in some time and see her,” Robyn explains. “She said that would be fine, so we had a lovely time and I was able to chat to her about where I’d been – you know, my main aim was to lead these people to Jesus, but you can’t start straight off on that. During that first meeting with Elaine, Robyn said she would love to meet other women who lived in the prestigious apartment block. Robyn gave Elaine six weeks to find 10 people. After six weeks, she rang up again – and Elaine had found exactly 10. “I said ‘that’s wonderful,’ so we worked out the date and I went. It was the most beautiful time because those women didn’t know each other! They’d never met each other and they lived in the same building! So they were chatting and looking at the views from her apartment and so on and I had a lovely time and it was very easy. Robyn recalls one sad lady she visited who lived in utmost luxury in the Park Regis penthouse. While many of the women from the Park Regis attended the cathedral now and again, Elaine became a regular member and came to a genuine faith. After the service, her bemused family came up to Robyn and asked where all the people at the service had come from. “Her life became a testimony without her knowing.